Joining the ever-growing number of smart cities that have chosen more efficient technology to light their streets and saving money in the process, the City of Carpinteria in November 2011 completed its retrofit project of replacing all its existing city-owned high-pressure sodium (HPS) decorative street lights with energy-efficient LEDs. 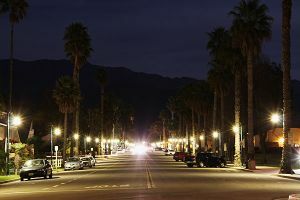 The lights are located on several blocks of Linden and Carpinteria Avenues in the downtown area and include lights on the Amtrak rail platform and its adjoining public parking lots. According to the city’s calculations, each of the 199 HPS lamps at 138 watts each consumed 604.4 kWh annually—a total of 120,284 kWh and an energy cost of $15,035 (at $0.125 per kWh, 12 hours of operation each evening). With the switch to the brilliant and more directional LEDtronics 29-watt LED bulbs, the annual energy cost came down to less than $3,160—a dramatic 80 percent savings. In addition, the LED bulb life is four to five times longer than the replaced HPS bulbs, resulting in reduced maintenance costs that yield additional savings. In addition to the $11,600 savings on its annual energy bill, this reduction in power usage by 96,000 kWh translates into a decrease of its carbon footprint by an estimated 33 tons of CO2 yearly. The Santa Barbara County city is a coastal community of 13,040, with small-town charm, beautiful beaches and breathtaking mountain views. It hosts the annual California Avocado Festival. “All of the lights installed so far have worked as promised,” says Roberts. “It’s great to know our streetlight electrical meters are turning more slowly, saving tax dollars. It’s also nice to know the products were assembled in the USA.” The product was designed and engineered at the LEDtronics factory in Southern California. The project started in early 2010, when the city began to study the conversion of pendant street lights in its downtown area to LED bulbs that are more energy-efficient, cast a more natural warm light and reduce light pollution. They looked for solutions that were cost-effective, more environmentally friendly and also more night-sky friendly. After testing the LEDtronics LED30HPS-600-SIW-002-BU pendant lamp for two months, the city applied for funds and received $74,117 from the California Energy Commission under the Energy Efficiency and Conservation Block Grant (EECBG) program from the U.S. Department of Energy, which is part of the American Recovery and Reinvestment Act of 2009 (ARRA). The bulbs are certified “Made In USA.” The total project cost was $78,580. Carpinteria’s lighting efficiency project is in line with the California Long Term Energy Efficiency Strategic Plan, which holds the state’s local governments to be leaders in energy efficiency by 2020, both for their own facilities and throughout their communities. The city so far has replaced over 90% of its traditional street lights with LEDs. According to city officials, the LEDtronics LED bulbs were selected because of their high efficiency, appropriate 3000K color temperature, and because they fit inside the existing globe diffusor without significant modification. The new LED bulb also allowed for the elimination of the HPS bulb’s ballast and starter. As well, LED bulbs produce little or no ultraviolet light (UV) which, as generated by the HPS bulbs along with the high heat, causes the polycarbonate globe diffusers to yellow and become brittle. With longer life for the globe diffusers and reduction of visits to each light by maintenance staff, the 10-year projected cost savings is expected to reach $150,000. This is in addition to the significant energy savings inherent in the LEDtronics LED bulbs that the city has already started to enjoy. Based in Torrance, California, LEDtronics, Inc., since 1983 has been a world leader in designing, manufacturing and packaging Solid State Lighting products and state-of-the-art LEDs to meet the world’s constantly changing lighting needs—from industrial control panel LED indicator lights to solid-state LED street lights, from direct incandescent- replacement based LED bulbs to direct fluorescent-replacement T8 LED tube lamps. logies to design and develop engineering solutions, needed a low-voltage but bright light source with minimal wattage consumption. The 10-30VDC area street light was for a project that the firm was developing for remote field security applications at U.S. Marine bases. Most importantly, it needed to be American-made with reliable sustainability. The LEDtronics SLL006-3D86-TPW-004-10/30V cobrahead light fixture fit the bill. It consumes only 60 watts and provides around 3,525 lumens; its 20 lb weight lends itself to portability. The system as designed is a portable drop-and-go light source. 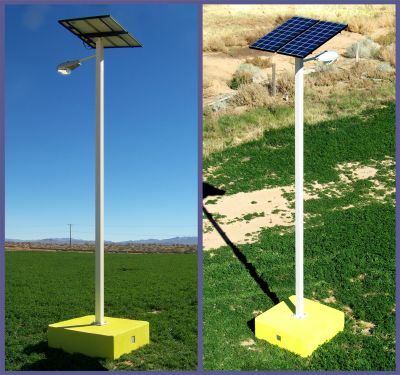 Once delivered to a site, it can be assembled in less than 20 minutes and becomes a quick and efficient light source in a very short time. It has a long battery-operated life and, as an option, can operate a 120V receptacle at the base. LEDtronics solid-state lighting products keep helping companies such as Barstow-based Terawatt Construction to provide energy-efficient solutions to industry and government institutions with alternate and renewable energy sources. After five years of restoration, modernization and seismic retrofitting, the historic Rotunda building of the Los Angeles County Natural History Museum in July 2010 reopened with a new face and a whole new set of lighting—decorative LED bulbs supplied by Torrance, California-based LEDtronics, Inc. Renovation of the 97-year-old Beaux Arts-inspired building was part of a multi-phase, $107-million project that included the modernization of the electrical system to support multimedia presentations and events, improve climate control and enhance exhibition lighting in an energy-efficient manner. Modernizing of the lighting system involved a retrofit from incandescent light fixtures with custom-manufactured LED systems without compromising the historical integrity of the original fixtures, notably in the Rotunda. LEDtronics provided 90 of 5-watt PAR38-180 Series bulbs and 160 of 1-watt DEC-G25F Series frosted bulbs through the distributor, American Electric Supply of Corona, California, to the contractor of record. The lamps were first installed in summer 2008. 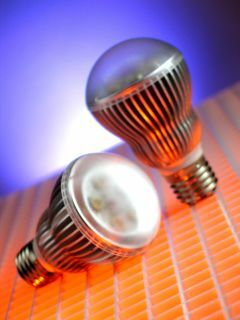 Both types of bulbs offer a color temperature of 3000 Kelvin. Most of the PAR38-180 bulbs were of a narrow beam configuration, and were positioned in a crisscrossing beam fashion around the perimeter of the 57-foot-high Rotunda dome—the centerpiece of the museum building. The rest were medium beam, and were installed in recessed fixtures as down lights around the building’s upper walkway. Use of the 5-watt LED lamps represents a minimum savings of 4,000 watts when compared to the 50-to-60-watt incandescent PAR-style bulbs that might otherwise have been utilized. 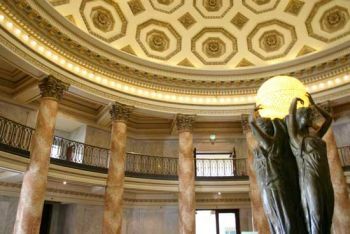 The DEC-G25F-style frosted globe lamps were used as accent lighting all around the inside perimeter of the Rotunda. The complete installed set of 1-watt LED bulbs only consumes about 160 watts, compared to the 2,240 watts that would otherwise be consumed had the architect designed in a similar set of standard 14-watt G25 incandescent bulbs. The LED bulbs were installed not only to reduce energy consumption and improve light quality but also to reduce maintenance costs. Incandescent bulbs would go out often and the poor accessibility made replacing them difficult. Based on the LED’s 50,000-hour operational lifetime and the museum’s weekly hours of operation, maintenance teams will need to replace the LEDtronics lights only about once every 15-plus years. There is another advantage to the LED switch: The dramatic reduction in lamp-generated heat. This provides major benefits both in terms of much less air-conditioning required to keep the older bulbs cool, and also because keeping the temperature in the rotunda down is important since heat can cause the lead in the skylight to soften. Originally dedicated when the Natural History Museum opened its doors in 1913, the Rotunda, crowned by the stained-glass skylight, is one of the museum’s most elegant and popular spaces. The colonnaded hall has often been used as a filming location, while the museum’s distinctive main building is on the National Register of Historic Places. 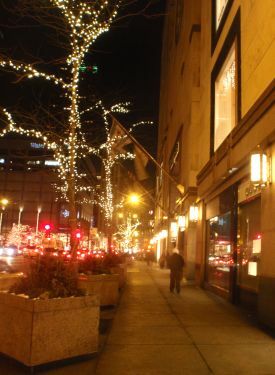 2009 marked the 50th anniversary of the lighting of the trees along North Michigan Avenue, which was the first street in the world to adopt this annual holiday event in 1959. For half a century, the trees along the Magnificent Mile, the roughly mile-long stretch of North Michigan Avenue between Oak Street and the Chicago River, have been illuminated to signal the official kick-off of the holiday season in the Windy City and around the nation. This stretch—one of the top-ten hospitality, fine dining and retail districts in the world—is, in many ways, the heart of the city, a place that bustles with life year-round. Christmas 2009 marked another milestone for the annual lighting event—the use of LED string lights to adorn the sidewalk trees lining the 900 block of Michigan Ave. called 900 West Shops. About 10 trees were festooned with 100 strings of LEDtronics string lights, replacing incandescent lights used previously and reducing energy consumption by 70%. In 2002, right after 9/11, eight-year-old Veronica Granite from New Jersey began a petition drive to illuminate her hometown bridge with red, white and blue lights. She had recently seen tricolor lighting atop the Empire State Building during a visit to Liberty State Park and thought the Bayonne Bridge should be similarly decorated in patriotic lights. Her lobbying efforts inspired the Port Authority of New York and New Jersey, which maintains the Bayonne Bridge—the fourth longest steel arch bridge in the world. After seven years, the historic span that connects Bayonne, New Jersey, with Staten Island, New York, wore a necklace of red, white and blue LED lights custom designed by LEDtronics, Inc. of Torrance, California. Spanning the Kill Van Kull tidal strait and first opened in1931, the Bayonne Bridge was the longest in the world until 1978. Today it carries about 20,000 vehicles per day over its four lanes. “When we initially showed the bridge Maintenance Group the LEDtronics 180-degree fixture that is used on the Vincent Thomas Bridge in Los Angeles Harbor, they liked the concept but needed the light to be 360 degrees and in red, white and blue,” says Jeffrey Mizel of RF Industries East, the representatives involved with the project. “As they also wanted to use the existing fixtures, we were provided with samples from the bridge, and LEDtronics engineers set about designing a BSD-1928-OPB-004—a retrofit, mogul-base, 360-degree design,” adds Jeffrey. It was a perfect solution. In 2009 the project was completed, and the 1,675 feet of the main arch span were illuminated with patriotic LED lighting using about 14 each of BSD-1928-OER-004 (red), BSD-1928-TPW-004 (white) and BSD-1928-OPB-004 (blue). The little girl, now a teenager, was inspired with what she saw. Other than the Bayonne and the Vincent Thomas bridges, the LEDtronics BSD-1928-001 series of lights are also installed on the South Capitol Street Bridge in Washington, D.C.
Two other bridges in the area are under consideration to be retrofitted with LED lighting. The Bayonne Bridge was dramatically blown up in the Steven Spielberg-directed 2005 movie War of the Worlds, starring Tom Cruise and Dakota Fanning. In the segment devoted to education and health, Amb. 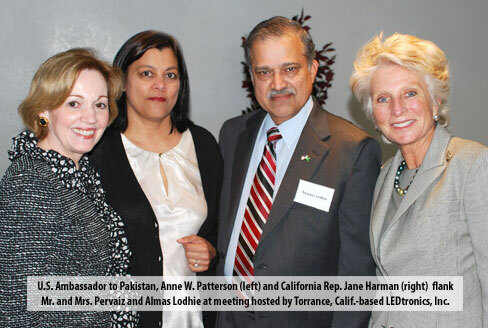 Patterson pointed out the dichotomy between Pakistan’s development of advanced weaponry and the inadequacy of resources devoted to the most basic of social needs. “It’s the lowest percentage of education and health expenditure on the planet,” she remarked. Mr. Lodhie concurred. “Unless you have the masses get basic education… children from these villages that have never gotten the opportunity to go to school will never become the scientists, the pioneers and the entrepreneurs that the country desperately needs,” he said, emphasizing the need to establish a top-down foundation of education from kindergarten to higher education. Torrance, Calif., Jan. 5, 2010 — LEDtronics, Inc., entering its 27th year of leadership in innovative LED lighting solutions, announces the newest members in its series of high-brightness, energy-efficient LED replacements for A19-style light bulbs for home and commercial use. The DEC-A19-5X1W DécorLED Series comes with softly diffused, precision domed lensing that directs light at a 95-degree beam, and is available in Warm White (3000 Kelvin) and Pure White (6000K). These A19-style LED bulbs offer long-term durability, low power consumption, environmental sustainability and money savings. They run on a flexible voltage range of 85-265 VAC requiring no special adapters, and replace 40W to 50W incandescent bulbs while consuming less than 7 watts of power. In addition, the series DEC-A19-5X1W DécorLED boasts an outstanding color quality of up to 85 CRI, a horizontal beam spread of around 130 degrees, powerful 416 (XPW) and 340 lumens (XIW) of brightness, easy drop-in installation in existing 26mm Edison or E27 European screw-in base sockets, and sturdy construction with UV-stabilized polycarbonate lens over five 1-watt, high-power Cree XR-E LEDs encapsulated around a unique grill-style, heat-sinking magnesium-alloy housing. Because LEDs have no filament, their solid-state design renders them impervious to shock, vibration, frequent switching and environmental extremes. With an average lifespan of more than 50,000 hours (5.7-plus years), white LED bulbs operate more than 20 times longer than the equivalent incandescent bulb, eliminating repeated relamping! Unlike compact fluorescents, LEDs contain no harmful mercury, and because they do emit negligible amounts of heat and no ultraviolet or infrared light, they protect what they are illuminating. The DEC-A19-5X1W Series features enhanced passive cooling that reduces junction temperatures, extending the life of the lamp. The fact that they run remarkably cool also means they greatly reduce the fire hazard normally associated with the use of incandescent lamps. These economical, elegant light bulbs offer a directional light that is perfect for use in recessed lighting, table/floor lamps, accent and decorative lighting, garage or workshop lights, down lights and ceiling cans, marquee signage and retail display. As a matter of fact, they are ideal for use anywhere you are currently using an incandescent A-19-style light bulb, including outdoor applications when contained in a sealed housing. Since LED lights are 300% more efficient than compact fluorescent lamps, these bulbs are perfect operating on an alternative or renewable energy resource such as solar or wind power, in cold or warm environments. These maintenance-free lamps come with a 3-year warranty period and CE safety assurance, and are RoHS certified—they adhere to strict European guidelines concerning the Reduction of Hazardous Substances such as lead and mercury. Since they produce no harmful ultraviolet or infrared radiation, they reduce light pollution, and are compatible with the international “Dark Skies” initiative. The LEDtronics 7-watt DécorLED bulbs — DEC-A19-5X1W-XIW-001W (Warm White) and DEC-A19-5X1W-XPW-001W (Pure White) — retail for $57.90 each. Availability is stock to 4-6 weeks for special requirements. For additional information on how to incorporate incandescent-replacement, energy-saving, LED light bulbs into your facility lighting plans or architectural designs, contact LEDtronics toll free at 1-800-579-4875, telephone 310-534-1505, fax at 310-534-1424, email us at webmaster@ledtronics.com or postal mail at LEDtronics, Inc., 23105 Kashiwa Court, Torrance, CA 90505. Torrance, Calif., Feb. 1, 2010 — LEDtronics, Inc.®, has introduced LED replacements for recessed T-bar fluorescent ceiling luminaires: CLL2X2-400-TPW-001W uses only 24W power and replaces 2ftx2ft standard fluorescent 64W units, while CLL2X2-800-TPW-001W consumes less than 36W and replaces 80W fluorescent fixtures. They operate on a voltage range of 100-277VAC, providing solid-state 5000K pure-white lighting that creates less heat compared to conventional lighting, reducing air conditioning demands in offices, closets, hallways, classrooms, work rooms, conference rooms and other retail or commercial indoor lighting locations. The LEDtronics luminaires offer up to 300% longer lifespan compared to fluorescent lamps, using up to 50% less energy than standard fluorescent 2’x 2′ panels, without compromising on performance. The CLL2X2-400-TPW-001W provides a bright beam of 1,840 lumens, with an efficient power factor of 1.0, while the CLL2X2-800-TPW-001W offers 2,753 lumens and a power factor of 0.99. Both deliver a high Color Rendering Index of 75 that enhances all colors in the lighting environment. The luminaires are easily installed using existing T-bar recessed 2ft×2ft module light fixtures, and are solidly constructed featuring a 22-gauge, cold-rolled steel housing with baked white-polyester finish; clear prismatic acrylic lens in a 20ga steel frame, with T-hinge and positive spring-loaded latch. The housing and power supply are UL-rated, and the units are compliant with Restriction of Hazardous Substances Directive (RoHS), making them human- and environment-friendly, free of lead, mercury or other toxic metals. They also are free of harmful ultraviolet or infrared emissions as well as RFI/EMI/HD — problems related to fluorescents in hospital radiology areas, sensitive instruments, etc. The LEDtronics fixture units come with a three-year full warranty. Because LEDs have no breakable glass nor toxic gases, their solid-state design renders them impervious to shock, vibration, frequent switching and environmental extremes. With an average lifespan of more than 50,000 hours (5.7-plus years), these maintenance-free LED luminaires eliminate repeated relamping, and operate in ambient room temperatures of -22°F to +104°F [-30°C to +40°C], providing much better performance in cold freezer-type applications. For additional information on how to incorporate the LEDtronics 24-inch-square recessed T-bar fluorescent ceiling luminaire replacements — CLL2X2-400-TPW-001W (replaces standard fluorescent 64W units, retails for $485.00) and CLL2X2-800-TPW-001W (replaces standard fluorescent 80W units, retails for $645.00) — into your facility lighting plans or architectural designs, contact LEDtronics toll free at 1-800-579-4875, telephone 310-534-1505, fax at 310-534-1424, email us at webmaster@ledtronics.com or postal mail at LEDtronics, Inc., 23105 Kashiwa Court, Torrance, CA 90505. Quantity discounts are available for qualified distributors. Availability is stock to 6 weeks. 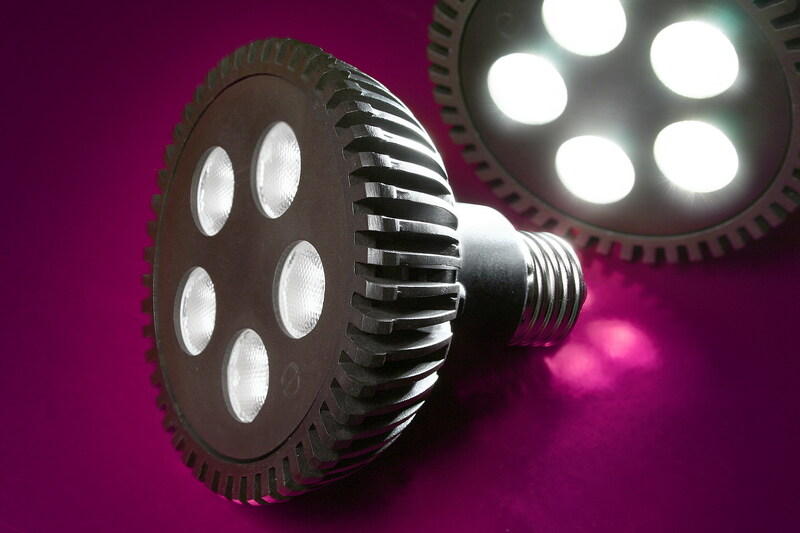 LEDtronics® announces its latest generation of PAR30-Style LED spotlight bulbs. The PAR30 LED bulb is made up of five three-Watt high-power LEDs. PAR30 LED bulbs are direct incandescent PAR30 replacements, combining advanced Light Emitting Diode (LED) technologies, standard 25mm Edison screw-in bases, and light optimizing designs producing 480 to 544 lumens of vivid light depending on the bulb model. PAR30 LED bulbs are available in a 40° light-emitting viewing angle, running on 80V to 260V AC current. Other voltages like 12Volt AC or DC are optionally available for qualifying customers. The LEDtronics PAR30-style lamp replaces a 50W to 75W PAR30 incandescent bulb but has a maximum power draw of only 15.8W. With a low power draw, high shock/vibration resistance, and long-lived high-power white LEDs — white LEDs lasting up to 50,000 continuous hours — you can see the savings quickly add up. PAR30 LED lamps are available in color temperatures of 3000Kelvin Warm White and 5000Kelvin Pure White. 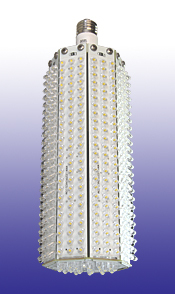 There are many ideal applications for this rugged long-life PAR30 LED bulb; track lighting, accent lighting, general area lighting, architectural and landscape lighting, display case fixtures and cabinet lighting, signage spotlighting and backlighting, aerospace lighting systems, industrial OEM equipment lighting, and truck-bay dock lighting to name only a few. The list price for each PAR30-style LED bulb is $110.00. Large quantity discounts are available for qualified distributors. Availability is stock to 6 weeks. PAR30 LED bulbs carry a three-year limited warranty. For additional information on how to incorporate energy-saving PAR30 LED bulbs into your architectural lighting designs, contact LEDtronics toll free at 1-800-579-4875, telephone 310-534-1505, fax at 310-534-1424, e-mail at; webmaster@ledtronics.com or postal mail at LEDtronics Inc., 23105 Kashiwa Court, Torrance, CA 90505. Visit our website at: www.ledtronics.com.